November 17 is National Take a Hike Day! I plan on taking advantage of this fantastic day by going for a hike with my faithful companion, Shadow. No matter the weather or your preferred activity, Ontario County’s Finger Lakes offers plenty of ways to experience the great outdoors! Go take a hike! There was a time when I didn&apos;t appreciate when someone would say this to me, but tell me to take a hike today, and I am like a child in a candy store. Do you want me to hike up a hill, walk in a creek bed to the spectacular waterfalls in Grimes Glen, or maybe experience the peaceful beauty of the trails at Ganondagan? The possibilities are numerous here in the Finger Lakes. The landscape of lakes, hills, waterfalls and the seemingly endless meadows are spectacular in any season for hiking, mountain biking, and Nordic skiing. Within the past few years, I started to hike year-round and to enjoy the beauty of our local environment in every season. Fall is certainly my favorite season as the leaves slowly begin to change and the air becomes a little brisker. Around then you will find my faithful hiking companion, Shadow, and myself enjoying the trails in our New York State Parks every chance we get. My favorite summer hike is Grimes Glen Park in Naples, NY. I choose to hike the glen in the summer because you need to get your feet wet to truly enjoy the beauty of the waterfalls you can find in the gorge. I had the amazing opportunity to hike Grimes Glen with a nature photographer who is filming Grimes Glen during all four seasons. I thought I was a very observant hiker, but I never realized how much I was missing until hiking with someone who noticed every fungus, every unique rock formation, and how the water flows in such spectacular ways. We hiked together a couple of days. The first day was a sunny, beautiful day while the second day was overcast and raining – yet, each day was distinctive in highlighting the beauty of the creek bed, the waterfalls and the vegetation in different ways. This hike comes well recommended no matter the weather. Be sure to have a sturdy pair of hiking shoes that you don’t mind getting wet! 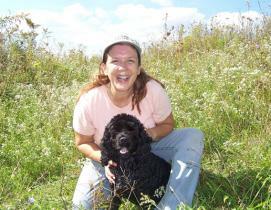 Another favorite hike of Shadow and I are the trails at Ganondagan State Historic Site in Victor. Once the site of a Native American village, Ganondagan, which was a flourishing, vibrant center for the Seneca people, today the state historic site is home to hiking trails, a replica bark longhouse and the Seneca Arts and Culture Center which preserves and promotes the culture of the Seneca people. The hiking trails here take you through various landscapes – forest, wetlands, and hilly meadows. Signs along the way give descriptions of the foliage native to the area, with the Seneca pronunciation and the various ways that Native Americans used the vegetation in their everyday lives. The Earth is Our Mother Trail is especially beautiful in the winter – there is an added peacefulness and serenity that I experience hiking on a crisp, cold day with the blue sky above. Harriet Hollister Spencer State Recreation Area is required for hiking in the fall. Located in Honeoye and overlooking Honeoye Lake, the view into the valley is spectacular with fall foliage as far as the eye can see. Hiking trails abound through the forest, with a carpeting of fall colors at your feet – or paws! For even more amazing hiking ideas, our friends at the Finger Lakes Land Trust have been diligently documenting great experiences. Read more about trails, see maps of trail heads, or watch beautiful videos at www.GoFingerLakes.org. You can also learn more about Finger Lakes State Parks in this amazing video produced by the Travel Channel. Happy hiking!